In the age of Amazon and round-the-clock home deliveries, couriers are becoming an ever more common presence on the UK’s roads. Despite this, many drivers may not know that they need specialist courier insurance to be fully covered, both for their vehicle and the items being transported. In this article, we will run through the many potential consequences for couriers who drive uninsured – or with the wrong coverage – and examine why goods in transit and public liability insurance are also must-have additions. Overall courier insurance covers you and your vehicle when delivering shipments out on the road. It extends far beyond private car, motorbike or van insurance – even if you take out “Class 1 Business use” cover – to make sure your vehicle is protected when using it to make multiple collections and drop offs, rather than one-off trips. As a rule, not being covered by courier insurance means that you are liable for any costs incurred when driving that are not covered by normal vehicle insurance. If you are found to have been using even a personal vehicle for work, basic insurance will not completely cover you, with many policies only accounting for third-party damage, fire and theft. In other words, if you’re liable for any damage or injury yourself, you could be in trouble, while there could be points on your license (a maximum of 8 per incident) and a significant fine just for failing to be properly covered. There are varying levels of courier insurance available beyond a basic provision. Some will include roadside assistant and breakdown recovery, meaning a quick recovery from any vehicle mishaps which could eat into your day’s work. A fully comprehensive policy will also cover damage done to a vehicle in the event of an accident which, as we all know, can happen at any time. Such cover could mean that you get your vehicle and business back on the road far quicker than without. Our courier insurance ensures you have the right level of cover for your business activity. In addition to the basic cover provided by courier insurance, goods in transit cover is worth considering. It will cover any goods being transported for a third party against loss, damage or theft and is usually considered an essential and long-term cost-saver when considering the best policy to take out. 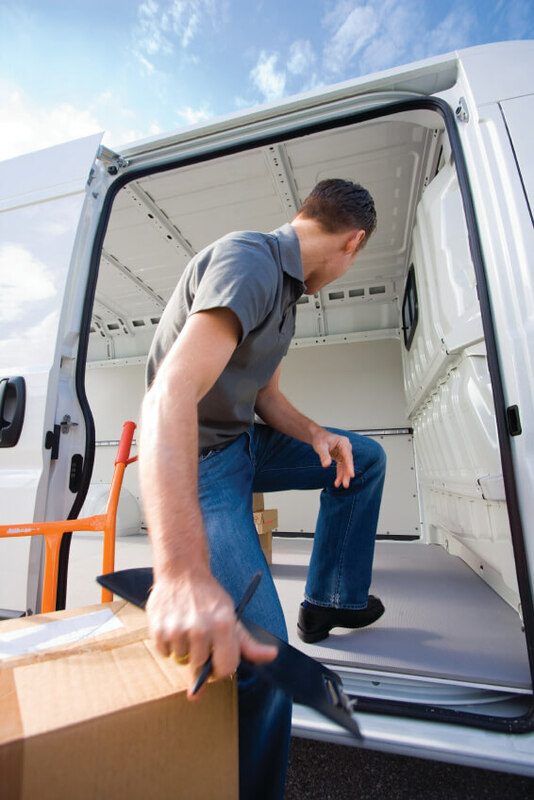 Without goods in transit cover, you will not be protected against accidental damage caused to a client’s property while conducting your business. In the event of a collision or similar, without goods in transit cover your vehicle and repairs may well be covered, but your precious cargo will not be. This goes for any injuries caused by or as a direct result of the cargo you are carrying. As couriers are out on the road as a matter of routine, the risks that your cargo is exposed to are many. Courier vehicles – particularly branded ones – can make a tempting target for thieves as it is sometimes easy to spot their multiple stops. Some policies even cover items left in vehicles overnight, so long as the vehicle in question is locked and parked securely. Without cover, you (and if applicable your employer or agency) are liable for any lost or stolen cargo, a significant undertaking if you are transporting expensive merchandise. An added benefit of goods in transit cover is that it can cover for when items are mislabelled, delivered to the wrong address or signed for by the wrong person, all of which could lead to your being liable for missing cargo. Losing part of or a whole shipment will lead to a short-term loss of earnings and will have a larger impact on your clients’ trust and your wider reputation. In addition to your vehicle and your cargo, there is one more vulnerable party out on the road: the public. Luckily, public liability insurance will help to cover your costs if you must pay compensation or legal costs because of injury to a member of the public, or damage or loss to their property. It also covers accidental death of individuals. As a courier potentially making many drops over the course of a day in a variety of places, there are many opportunities for you to encounter Joe Bloggs. These may not be immediately obvious: dealing with front-of-house staff at a delivery location might count, for example, or delivering goods to a commercial location. Although an optional extra, not having public liability insurance may mean that some clients will refuse to place work with you. This is particularly true of the public sector, with local authorities always keen to see proof of this cover. In general, carrying out courier work means you are making yourself vulnerable to any accidental harm or damage that occurs out on the road not already covered by other policies. The opportunities for something to go wrong and cost you or your business significant financial repercussions are many. Being covered for public liability from the get-go is the best way to avoid these losses. This is not an exhaustive list, and there are many additional policies which, if you do not at least consider taking out, could see you and your courier business punished by avoidable costs. If you’re employing other workers, for example, you may well need employers’ liability insurance, or fleet insurance if you’re maintaining multiple vehicles. In any instance, not being adequately covered means you are running a massive financial risk every time you get out on the road. No matter what kind of cover you require, it pays to take your time and study each quote and policy carefully.